These Tiny Hands necklaces are the cutest and hottest accessory right now. Adults and kids love them! 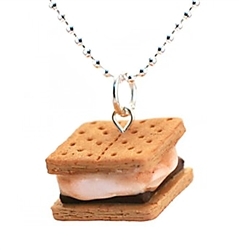 Perfect for summer and fall the Smores necklace is an all time favorite. Here is your chance to win one from HoneyPieKids.com If your looking for that unique and perfect gift check out all the other necklaces and rings Honeypiekids.com carries from Tiny Hands. They also offer a waffle necklace that smalls like buttered waffles that was also worn on the show Parks and Recreation on Amy Poehler. From cupcakes to a fried egg they have a lot of cute items and did I mention they are all scented. The Smores necklace smells like marshmallows and chocolate the pancake necklace smells like buttered pancakes, the chocolate cupcake smells like chocolate. Once you take a look you will have a hard time deciding what one you will like.